The Texas Committee for Environmental Equality held a number of hearings across the state. At the Dallas Public Library, a health care worker told them that asthma was the number one disease for North Texas children and that its incidence was growing. A spokesperson for a faith-based environmental organization put it bluntly: polluting Texas is a sin. Laura Miller, the mayor of Dallas, put together a coalition of municipal leaders from all over North Texas to oppose the coal plants. They and environmental experts predict more premature deaths, heart attacks, lung cancer deaths, asthma attacks, hospital admissions, and cases of chronic bronchitis. The utility companies say that Texas needs more electricity and that their proposal is the most economical way to get it, but they don’t add in the additional health care costs. TXU, the leading utility with sponsorship of 11 of the plants, says that they will reduce overall emissions 20 percent, but the environmentalists respond that TXU was already mandated by government order to reduce emissions 20 percent long before the coal plants became an issue! 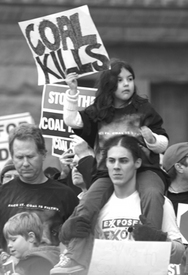 A large coalition opposing coal plants called for a rally at the state capitol on Feb. 11 and a lobby day on Feb. 12. Around 1,500 turned out on a dismal day to cheer for environmental responsibility. Speakers raised issues of health and global warming. The crowd was persuaded to stand behind a bill in the state Legislature to put a moratorium on new coal plants.